This year marks the 20th anniversary of the B-2 Spirit stealth bomber, an occasion that can only be properly immortalized by the crew at Orange County Choppers, apparently. I'm no warmonger, nor am I a motorcycle fiend, but I can appreciate both a landmark plane with an iconic design and a lavishly expensive bike all the same. 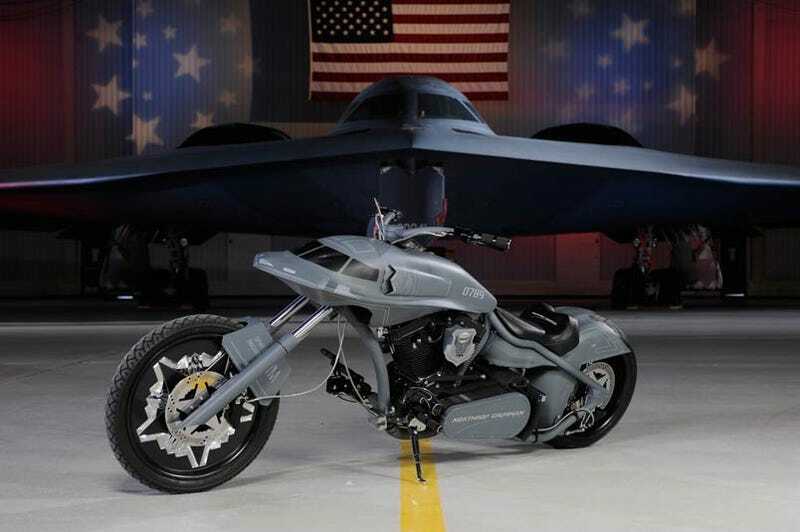 Yet when I look at this B-2 bike, all I can think is, the US Airforce actually spent money on that? How about we commemorate 20 years of the B-2 bomber with, say, the uber-badass B-2 bomber? Who cares that this bike has some of the original titanium from the original B-2 aft deck or that each wheel features some stupid scale models of B-2s in star formations? What's next, B-2 collectible cards in the spokes?